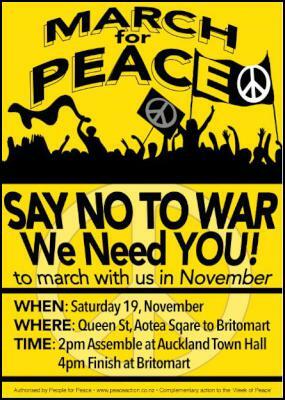 In response to the Government’s Week of War, peace action groups are coordinating a Week of Peace in Auckland. "Our week of peace is designed bring together individuals, groups, associations, not for profits and businesses that would like to to send a clear message to the Government and the New Zealand defence industry that a Weapons Expo and Warship visit is not acceptable." Please review the events and register for the event(s) you would like to attend. Nobel Peace Prize Nominee Dr. Helen Caldicott, the world’s foremost anti-nuclear activist and researcher speaks at 7:30pm, at the Auckland University of Technology. Hosted by the Peace Foundation. Wednesday 16th: Blockade the Arms Trade! Actively oppose the arms trade by the blockading the Weapons Expo. There are spaces for people who wish to actively blockade as well as space for support and family-friendly creative resistance. Check out the Facebook event for full details. Thursday 17th: WALL of NOISE – Drown out the Death Merchants. Join up with a boat, kayak, surfboard or your body to resist the warships coming into Auckland Harbour. Details confirmed closer to the day. Saturday 19th: March for Peace. Queen Street, Aotea Square. 2PM assemble at town hall, 4PM finish at Brittomart. We’ll be having a peace picnic in the midst of the Navy birthday celebration reminding everyone that war is not a celebration bring banners, picnic stuff and other peace materials. Friday and Saturday the 18th – 19th NOVEMBER, 2016: JUST WAR? 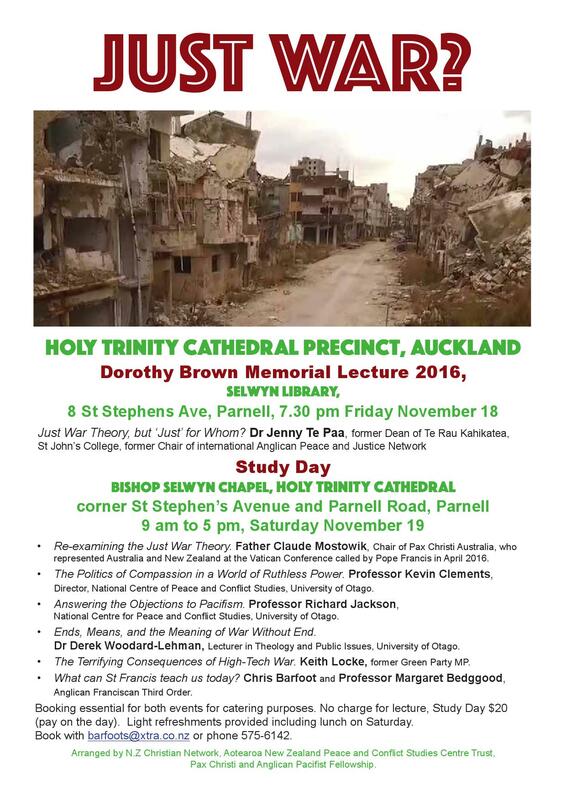 LECTURE AND STUDY DAY, HOLY TRINITY CATHEDRAL PRECINCT, AUCKLAND. Friday, November 18, 7.30pm, 7.30pm, Selwyn Library. Dorothy Brown Memorial Lecture Dr Jenny Te Paa. Saturday, November 19, 9qm to 5pm, Bishop Selwyn Chapel, Study Day with Father Claude Mostowik, Professor Kevin Clements, Professor Richard Jackson, Dr Derek Woodard-Lehman, Keith Locke, Chris Barfoot and Professor Margaret Bedggood. Booking essential for both events for catering purposes. No charge for lecture, Study Day $20 (pay on the day). Light refreshments provided including lunch on Saturday. Book with barfoots or phone 575-6142. Arranged by N.Z Christian Network, Aotearoa New Zealand Peace and Conflict Studies Centre Trust, Pax Christi and Anglican Pacifist Fellowship.